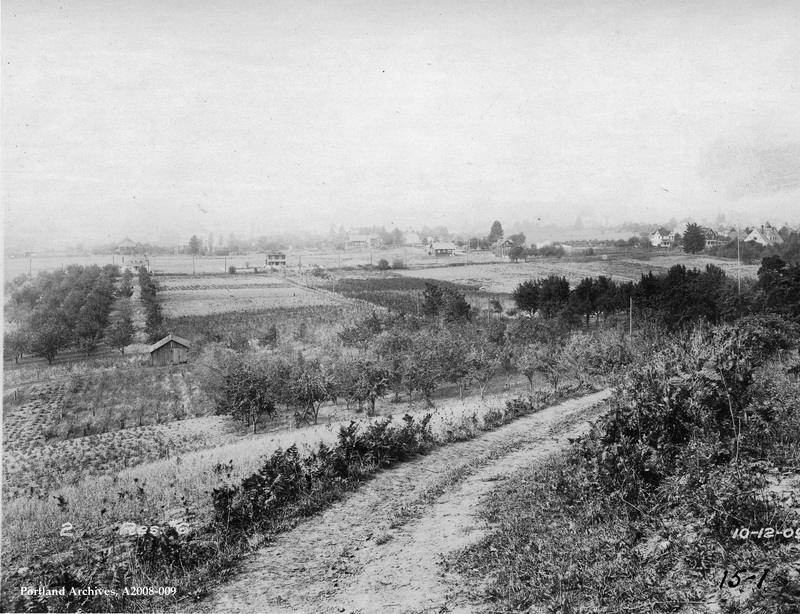 I wonder if any of those pre-1909 homes are still on SE 60th. Looking at a today view of houses (specifically #1409) along SE 60th Ave on Google Maps, appears that the tall two story with dormer (2nd on left in old photo) may still be; having undergone some major exterior changes (railings removed and roof lines extended outward, front entry modifications etc.) If so, that would mean that the future reservoir would occupy land out of view to the left; since the house in question ended up on the northwest corner of the finish reservoir. Just a wild guess. If you look at portlandmaps.com, there are a number of houses along SE 60th that were built in 1910 or before. I think the two houses on the right on either side of the tree are 1409 SE 60th (1910) and 5925 SE Madison (1906). But I can’t match up any more of the houses in the photos with the ones the show on portland maps as still being there. This guy across from Main looks like a ringer for the one to the right of the tree. Robert G – the house your picture shows is actually the house at the corner of Madison and 60th, 5925 SE Madison, built in 1906, as I said in my post. The house to the north is 1245 SE 60th, built in 1900, so we’ve identified those 3 in the cluster. But now I’m confused about the big white house across the street — portlandmaps says 1242 SE 60th was built in 1886 so it should be the same one, but wow it’s really been altered. Fun doing the detective work. I wonder if the folks who live in those houses now are aware of this photo. @Susan — I don’t know about the folks living in those houses now, but in recent weeks we’ve taken our IPads with the VP photos on them into two businesses that are in buildings featured in VP posts, to show them what their buildings/neighborhoods looked like decades ago. In each case, they were quite pleased to see the VP post. In one case, the employees subsequently contributed to the blog post showing their business. There’s a bungalow closer to the center of the photos, in front of a tall tree, which appears to be 5907 SE Hawthorne. It was built in 1909, so it must have been brand new in this picture. The small house to the south of it (across Hawthorne) appears to be in the same location as 1508 SE 59th, but I don’t think it’s the same one. The current house looks very different, and was built in 1910, the year after the photo. Good eye on that bungalow Dan. And that building with a steeple further down Hawthorne appears to be on the Western Seminary property, but is not the same as the chapel building that’s there now.